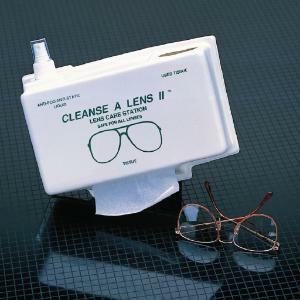 Keep safety glasses clean with our inexpensive lens care station. Cabinet can be mounted and has a receptacle for used tissues. Safe for all glass and poly-coated lenses. Delivery information: Includes 8 oz. of a special anti-fog/anti-static solution, and 800 lint free wiping tissues in a convenient heavy gauge plastic cabinet.